Automated reporting of contagious diseases increases efficiency and decreases the margin of error. 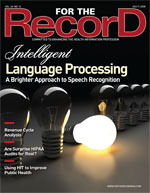 Electronic medical records (EMRs) are improving efficiency and creating new ways to capitalize on available technology. For example, a system has been deployed at Atrius Health, an alliance of five community-based, multispecialty groups in eastern Massachusetts, to increase the identification and reporting of contagious illnesses to the state’s public health department. The new system, called Electronic Medical Record Support for Public Health (ESP), is “increasing reporting yield and makes reporting more efficient by including all necessary clinical information in one step,” says Benjamin A. Kruskal, MD, director of infection control and travel medicine at Harvard Vanguard Medical Associates, an affiliate of Atrius Health, in Boston. Before ESP, clinicians would report contagious diseases by filling out paper forms and mailing or faxing them to public health authorities. The paperwork and time necessary to complete it could lead to delays in reporting or even failure to report. With ESP, the data are already collected and no additional work is required. “Among the most important features of the program is that it uses data from the EMR that is sent to ESP in a simple, uniform format, so that ESP can work with a wide variety of different EMR systems. This maximizes the utility and avoids any duplication of effort—the data transfer is all automatic once it is set up,” says Kruskal. ESP was sponsored by a Centers for Disease Control and Prevention (CDC) grant to Harvard Pilgrim Health Care and was developed in conjunction with Harvard Medical School, Atrius Health, and the Massachusetts Department of Public Health. In January 2007, the ESP pilot went live and was populated with data dating from June 2006. The data included patient demographics, vital signs, test orders, test results, prescriptions, diagnostic codes, and healthcare provider details. To ensure patient privacy and HIPAA compliance, the connection between the practice’s EMR and the ESP workstation is physically housed at Harvard Vanguard Medical Associates and electronically within the practice’s firewall, says Kruskal. “Data transmission between the ESP computer and the public health authorities is via the Public Health Information Network Messaging System, a secure, encrypted messaging system devised by the U.S. Public Health Service for messaging to and between public health organizations,” he explains. To ensure timely data transmission from patient visits, the data are automatically exported from the EMR to the ESP computer every 24 hours. This allows the data to be analyzed without taxing the practice’s EMR. Seven diseases are currently detected by ESP and reported to the state health department: chlamydia; gonorrhea; pelvic inflammatory disease; acute hepatitis A, B, and C; and active tuberculosis. When a disease is detected, ESP generates an electronic report and transmits it to the health department via a secure Internet connection. The report includes the patient’s name and contact information, clinician’s name and contact information, disease diagnosed, laboratory test results, prescriptions, pregnancy status, and any patient symptoms that were inferred from ICD-9-CM codes in the electronic record. To determine ESP’s efficacy, the system was compared with manual reporting from June 2006 to July 2007. During the study period, the practice’s conventional reporting continued routinely, independent of ESP, under the auspices of an infection control practitioner in some facilities and through spontaneous clinician initiative in others. The practice’s personnel were not informed of cases identified by ESP, according to Morbidity and Mortality Weekly Report (MMWR). During the study period, ESP increased reporting by as much as 53% with no errors compared with manual reporting. Compared with passive, paper-based reporting, ESP increased the number of chlamydia reports by 39% (758 vs. 545 cases) and gonorrhea by 53% (95 vs. 62 cases). In addition, ESP identified 20 cases of pelvic inflammatory disease compared with none identified by passive surveillance, as well as four cases of acute hepatitis A compared with one using the other method. The charts of all cases identified by ESP were manually reviewed and matched with conventional, passive surveillance case reports in health department records, as stated in the study report, “Automated Detection and Reporting of Notifiable Diseases Using Electronic Medical Records Versus Passive Surveillance — Massachusetts, 2006-July 2007,” in MMWR. Pregnancy status was another area where reporting numbers increased. ESP reported pregnancy status in all of its case reports compared with 5% in passive surveillance reports. Additionally, ESP reported 81 cases of pregnancy where chlamydia or gonorrhea were not noted on passive surveillance reports, according to the study findings. Lastly, passive surveillance reports had a 5% rate of transcription errors compared with zero errors in ESP reports. EMR use in Massachusetts alone is expected to rise from 45% in 2008 to 75% in 2010. With this increase, programs such as ESP can allow for quicker detection and faster action to prevent transmission of infection, says Alfred DeMaria, Jr, MD, director of the Bureau of Communicable Disease Control at the Massachusetts Department of Public Health. Interest in ESP is not limited to Atrius, however. “There is also active work going on with the Massachusetts eHealth Collaborative and discussions have been underway with members of the Massachusetts League of Community Health Centers and with Cambridge Health Alliance and with the New York State Department of Health,” adds Kruskal. — Kim M. Norton is a New Jersey-based freelance writer specializing in healthcare related topics for various trade and consumer publications. She can be contacted at kim_norton1@hotmail.com.